Vacuum collector for mobile clearing of leaves, waste and litter. 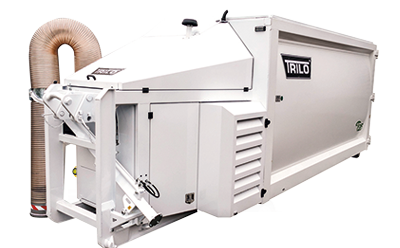 The large TRILO hooklift vacuum collector is ideally suited for mobile collection of large quantities of leaves or litter with a large loading volume. The operator can operate the suction hose remotely where it is mounted on a hydraulic retractable-extendable boom that moves back and forth. That way very large amounts of (waste) material can be vacuumed in a mobile way. The container can also be used standalone. As an option, a water spraying system is available that ensures a reduction in dust that can be released. The vacuum collectors are equipped with a sound dampening package and can be supplied with low-emission diesel engines and are therefore suitable for use in urban areas. When the collector is full, it can easily be emptied. • Powerful fan with strong suction power. • Mobile collection of large quantities of leaves and litter. • Suitable for working in urban areas. • Simple moving onto or from truck using hooklift system. • Easy to operate using radio remote control. • Low noise level of 87 dB(A).